The second part of an article/tutorial on using the YSlow firebug extension to optimize web site performance. This article is a continuation of a previous article. 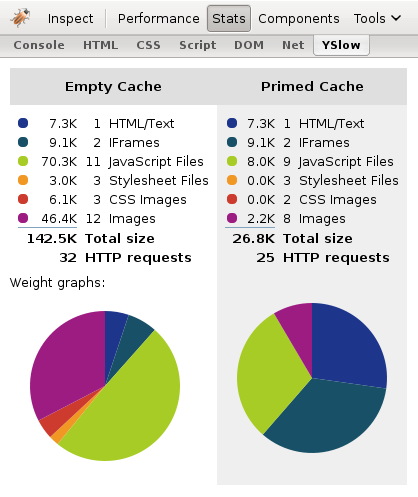 If you haven’t yet, read the previous article: Using YSlow to Optimize Web Site Performance. In this post, I’ll cover rules 5-13 and summarize the results of the optimizations that I made to my site. A number of these rules are fairly simple, so I’ll cover some together. I’ll be honest here. I didn’t even know CSS had expressions until I saw this rule. YSlow recommends avoiding them because they are evaluated an absurd number of times. External files can be cached indepently. If your users usually browse to more than one page on your site or you have frequent returning visitors, this should improve load times. DNS lookups can still take a fair amount of time even on a broadband connection. Basically, try to keep the number of unique host names fairly low. There is one competing performance benefit to serving page components from multiple hosts. It turns out that most browsers will only make two simultaneous connections to a given host. So, serving content from multiple hosts can speed up page load times especially if there are a lot of components. These two rules are fairly easy to follow. Sometimes you can’t avoid redirects such as when you move to a new domain or restructure your site. Those sort of redirects are good and they maintain the reputation your site has built with search engines. That said, a lot of redirects can be eliminated simply by adding a trailing slash to a URL. Be especially mindful if you’re working on hand-coded sites rather than CMS-based sites. Remove duplicate scripts is pretty obvious. Unfortunately, Google Adsense serves the same scripts for each ad on a page and there’s no way to fix it. I’m somewhat disappointed that after all of that, my score barely improved, moving from an F (59) to a D (63). Unfortunately, most of the remaining areas of optimization are either unrealistic as in Use a CDN or are out of my control. 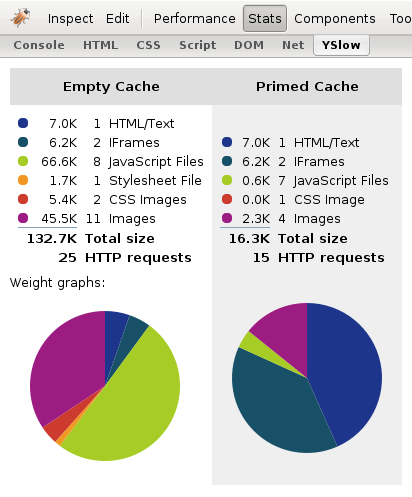 Of particular note: in the case of a primed cache, I reduced the number of HTTP requests from 25 to 15. Overall, I’m satisfied with the performance improvements. Even if the improvements are not amazing, working with YSlow is not particularly hard or time consuming. In fact, writing this article took much longer than the actual changes I made to my web site. A 15% reduction in load times is worth an hour or two of writing scripts and changing server configurations. 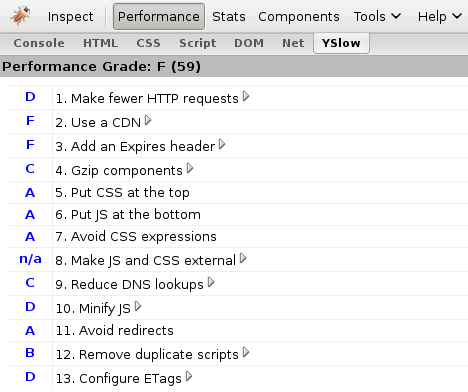 An article/tutorial on using the YSlow firebug extension to optimize web site performance. I’m a big fan of Google Tech Talks. Recently, I caught a particularly interesting one from Steve Souders called Life’s Too Short – Write Fast Code. Steve Souders used to work for Yahoo! as their chief web performance guru; he now does much the same at Google. The talk was a continuation of a previous lecture on a firebug extension that he wrote called YSlow. Suffice it to say, he knows what he’s talking about when it comes to high performance web sites. Anyway, it piqued my interest, so I decided to try to improve the performance of my own site. This article/tutorial and the next chronicle the changes I made and the results that I obtained. Clicking on any rule takes you to a page explaining it in more detail. A quick note: the screenshot above was taken before I disabled Woopra, which is web analytics software similar to Google Analytics. I had tried it out a couple months ago and had simply forgotten that I had it enabled. Disabling Woopra improved my grades very slighty in a number of rules, but I don’t include that optimization in the main article because it’s technically a functional change to my site. As explained below, YSlow doesn’t make functional recommendations. What follows are the changes that I made to my site, rule-by-rule. I also modified both plugins to no longer include a link to their original stylesheets in the <head> section of the page. Search the PHP files for references to the original stylesheets and comment those lines out. Before moving on, it’s worth mentioning that you should use CSS sprites if at all possible. Many sites use tens of icons per page. Combining those tiny icons into one sprite is a huge performance boost. One persistent criticism of YSlow is that it focuses on performance improvements to major sites. I don’t really agree with that; in fact, nearly every rule applies equally to both small and large sites. Use a CDN is the exception. A CDN allows you to serve content to users from geographically close servers. It’s a decent performance improvement, but it’s also incredibly expensive. ExpiresByType image/gif "access plus 10 years"
ExpiresByType image/jpeg "access plus 10 years"
ExpiresByType image/png "access plus 10 years"
ExpiresByType text/css "access plus 10 years"
Warning: The preceding configuration means that any time you change an image or stylesheet served my Apache, you must rename it. If a browser or proxy server has the component cached, it will never check to see if its version is the same as the version on your server. For images, this is probably not an annoyance; changing an image usually means uploading a new version in which case it will have a different file name anyway. For stylesheets, this can be annoying if you don’t automate the process. The script reads a number in from serial.txt, increments it, creates a new stylesheet with the number appended, and in this case modifies WordPress’ header.php to link to the new stylesheet. Every time I want a different style on my site, I modifiy style.css.original and run this script. When I started writing this post, I didn’t realize how long it was going to be. Part two, which will include the other 9 easier-to-implement and less important rules, should be up within a few days. I’ll also include some before-and-after performance statistics. 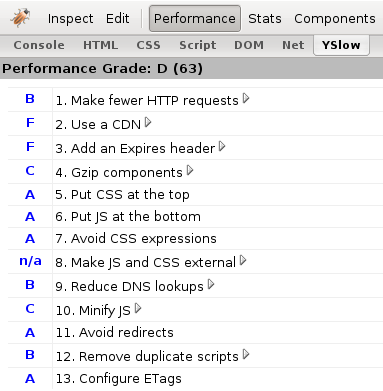 Part two is now finished: Using YSlow to Optimize Web Site Performance Continued.